As a leader, achieving your project goals depends on one important thing: team communication. Often, the secret for the success or failure of any project or initiative within the company lies in the ability of your team members to interact and convey information to each other. In an open, friendly and professional work environment, projects are accomplished on time and orchestrated like a machine. Each member of the team is aware of and keen to fulfill their roles and responsibilities. What a dream! Unfortunately, it’s not cut and dry for most of us. A lot of workplaces don’t operate this efficiently. Personal misunderstandings, endless back-and-forth discussions and backlogged teams all result in stress and project delays. This is where effective team communication strategies come in. Implementing one can keep all stakeholders aligned with your targets and provide a structured way of communication with each other. It allows information to travel freely across the group and reach the right people at the right time. Team communication is one of the secrets to building great teamwork. With this, you may be asking yourself, what are the best team communication strategies? 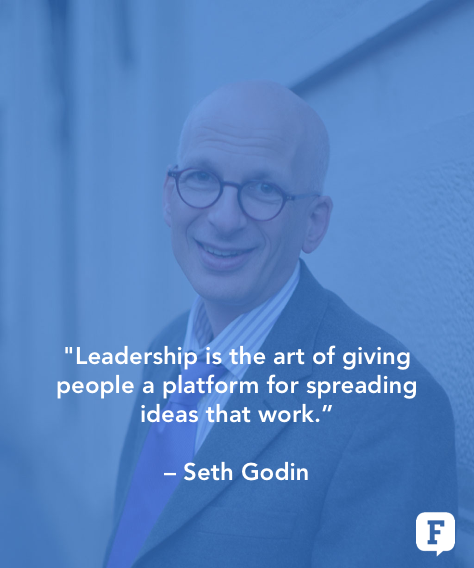 We looked at the secrets of how the most successful leaders and CEOs engage their employees and inspire their team to move forward. There are two schools of thought about how information should flow within companies. By far the most common way is chain of command, which means that you always flow communication through your manager. The problem with this approach is that, while it serves to enhance the power of the manager, it fails to serve the company. 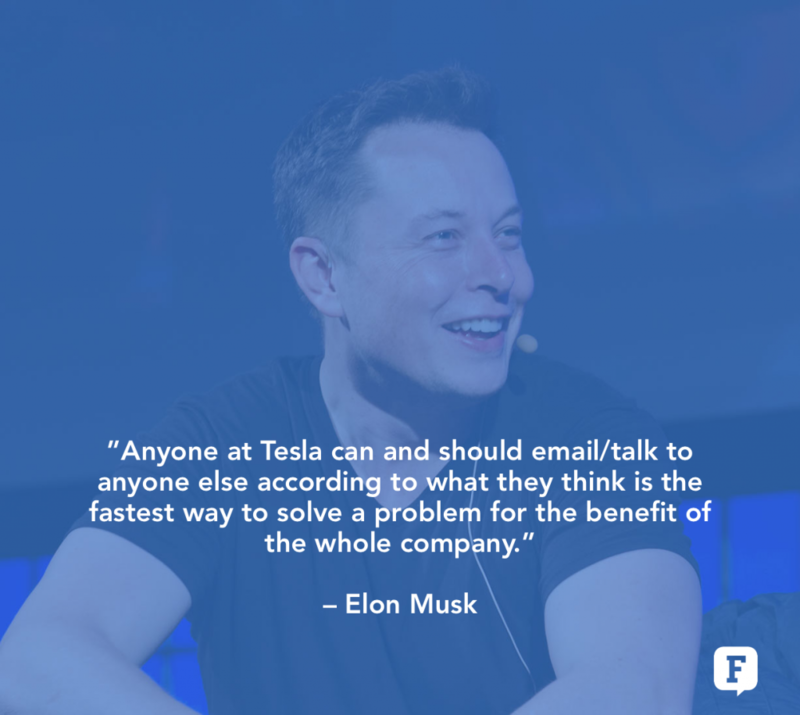 Anyone at Tesla can and should email/talk to anyone else according to what they think is the fastest way to solve a problem for the benefit of the whole company. You can talk to your manager’s manager without his permission, you can talk directly to a VP in another dept, you can talk to me, you can talk to anyone without anyone else’s permission. In a traditional setting, business communication should go through proper channels. Often, this means relaying your message in a chain of command and through layers and layers of people that are not privy to that information anyways. The problem with this type of strategy is that there can be significant delays and there is always information that gets left out and context gets thrown out of the equation entirely. By the time you get your answer, it’s all watered down. To you Mr. CEO, I say, tear down the walls standing the way of effective communication! The best way to solve this is to have an open-door policy where everyone is free to communicate with each other regardless of position or tenure. Having this in place allows people from your team to ask the right questions, express concerns or issues and propose ideas without fear from being drowned in the sea of bureaucracy. Keeping doors open empowers your team members to make decisions for you and it builds trust and independence. Making accessibility a challenge for everyone sets the tone that we should only work around our silos and be confined to our internal work flow. That should not be the case. Removing obstacles in communication allows for everyone to be more agile and solve their problems before raising them in the next team regroup. 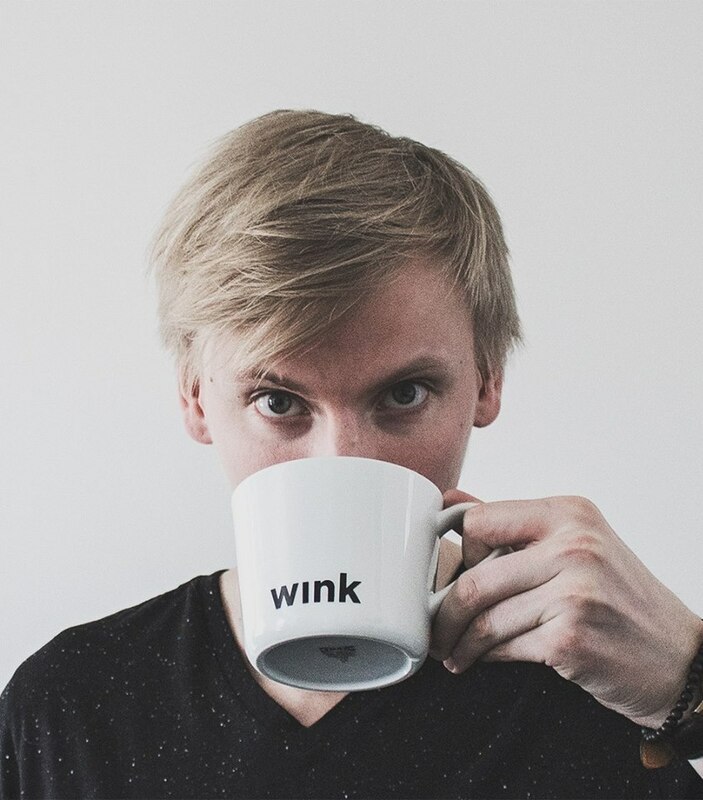 An easy way to apply this is by bringing everyone on-board a flexible messenger app like Fleep and making the boundaries for communication more relaxed. 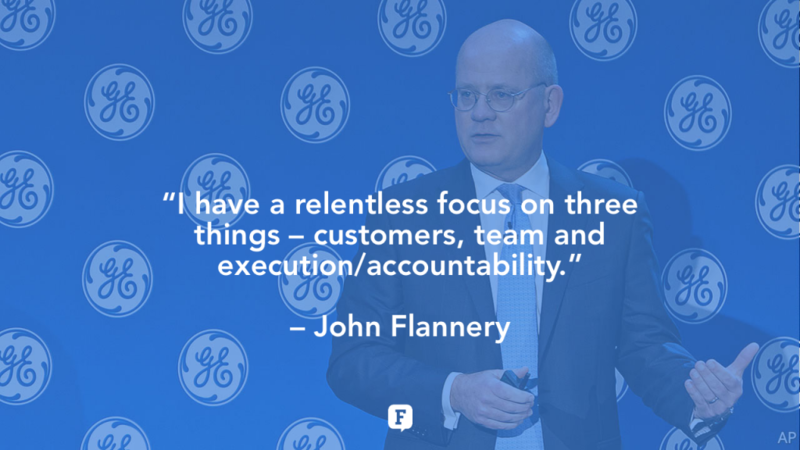 I have a relentless focus on three things – customers, team and execution/accountability. If you’ll notice, Flannery didn’t highlight 10 or even 5 initiatives. John Flannery knows that people can only carry and pick up 3 or 4 key messages. The best way to get your team members to remember and follow things is to be precise and specific in what you want them to do. Giving and relaying too many action points and next steps often confuses your team and our cognitive understanding cannot process too many ideas at once. This is what researches refer to as “cognitive backlog”. The best way to solve this within your team is to foster the rule of 3. By boiling down everything into just 3 key points, you’ll avoid the fluff and just focus on what matters to people. I learned that effective communication starts with the understanding that there is MY point of view, (my truth), and someone else’s point of view (his truth). Rarely is there one absolute truth, so people who believe that they speak THE truth are very silencing of others. When we realize and recognize that we can see things only from our own perspective, we can share our views in a nonthreatening way. Statements of opinion are always more constructive in the first person “I” form. 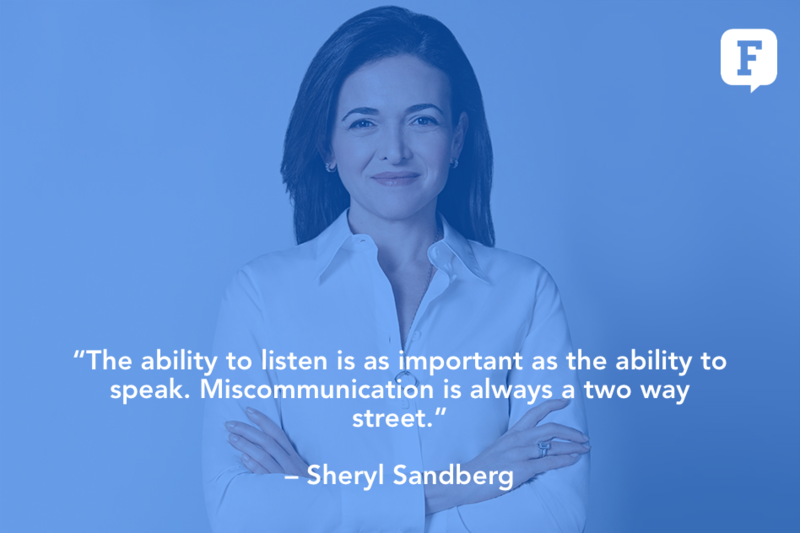 The ability to listen is as important as the ability to speak. Miscommunication is always a two way street. Sharing your views in a nonthreatening way is necessary so other people in the room wouldn’t feel put down, silenced. Even more, it shows that you listen and hear what others are saying as well. In this way, no one will feel discouraged from speaking up in the team, fostering the kind of team culture where effective team communication “just happens”. One evening about a month before the prospectus was due, my boss–then the CFO of the company–sat in with my team to review our progress. I thought everything was right on track, but he painstakingly pointed out that there were about 187 holes in the draft document: critical financial information that was still missing, even the phone number of the new company we were forming. We spoke about the need for me to be more focused on details and to follow up consistently with my direct reports to make sure things were getting done. At the end of the conversation, I was worrying about my own future. [But] He went out of his way to reassure me that my missteps weren’t fatal, that he still valued and supported me, It made me understand that when people feel valued, they can hear difficult feedback without being demoralized by it. Instead, they feel motivated to change. 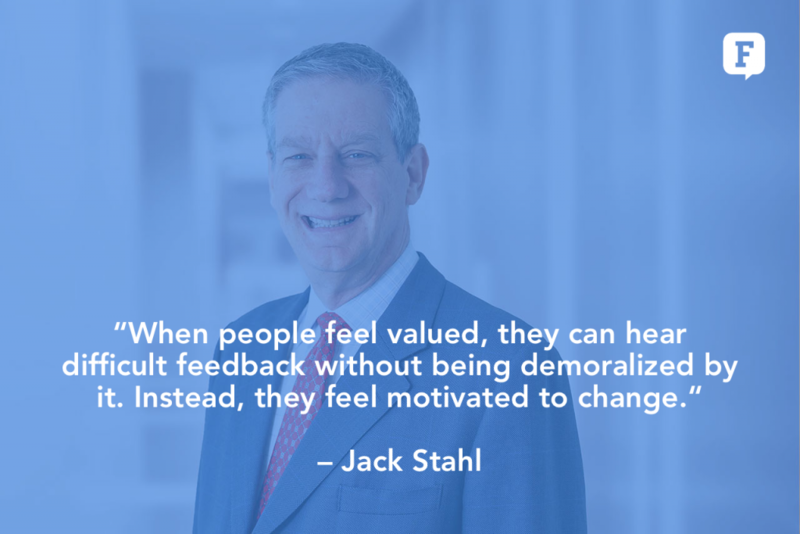 Feedback is necessary to make sure that mistakes are avoided again in the future and your team members understand what needs to change. Remember that constructive criticism should remain constructive. To make feedback more effective, make it clear to everyone in the team. Be detailed and concise on what needs to happen moving forward. At the same time, accept criticism as well. Effective team communication is about giving everyone the opportunity to speak out and give each other the tough love they need. Our very unusual willingness to share most of the numbers of our business with all the associates … It’s the only way they can possibly do their jobs to the best of their abilities—to know what’s going on in their business. … Sharing information and responsibility is a key to any partnership. It makes people feel responsible and involved …. In our individual stores, we show them their store’s profits, their store’s purchases, their store’s sales, and their store’s markdowns. This is by far one of the most effective ways to bridge the communication gap in the workplace. Honesty builds trust in the team. The key here is to be as open and transparent as possible. 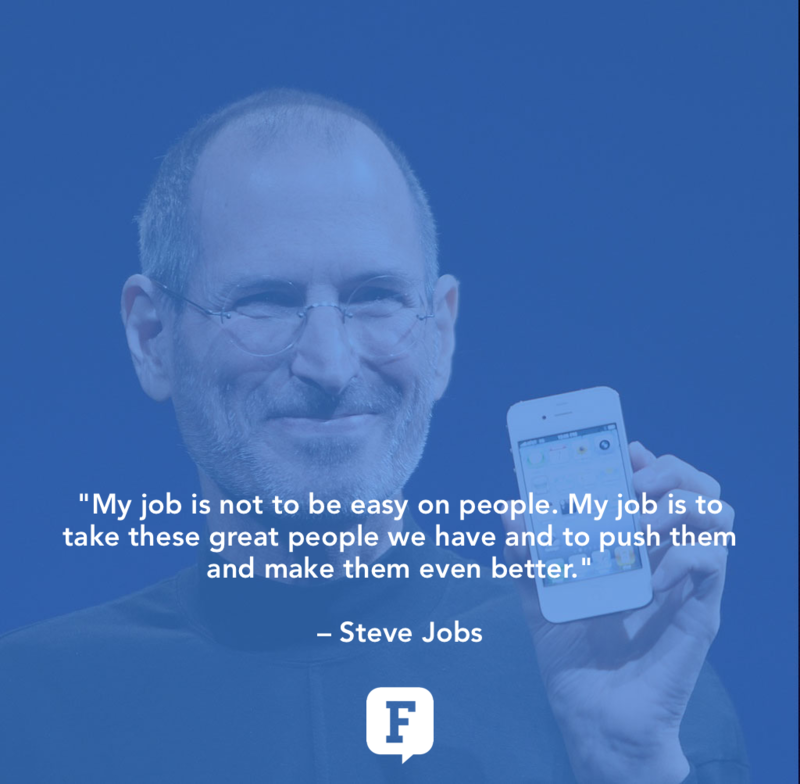 Don’t make your employees feel like things are being hidden from them. While there will always be sensitive information you cannot divulge, it’s better to be clear why some information is not being shared. Give your employees the assurance that they can be honest with you without any pushback and ask if they would do the same thing to you. Mutual understanding and belief in one another can be beneficial to any professional relationship. The most effective managers and leaders know how to relate and understand their employees. This involves admitting to failure or lapse in judgement. Taking steps to owning up mistakes you have done can show that everyone is susceptible to mistakes and gives you a sense of humanity that your employees value. When aligned with the company’s spirit, personal goals and values enable people to do more. In keeping with this, it’s important to allow interactions within the workplace that foster this kind of alignment. Set informal meetings with your team members via coffee breaks or lunch outs. It has been shown by research that conversations over coffee or lunch promote healthy communication and encourage open discourse on ideas. We use the phrase “disagree and commit.” This phrase will save a lot of time. If you have conviction on a particular direction even though there’s no consensus, it’s helpful to say, “Look, I know we disagree on this but will you gamble with me on it? 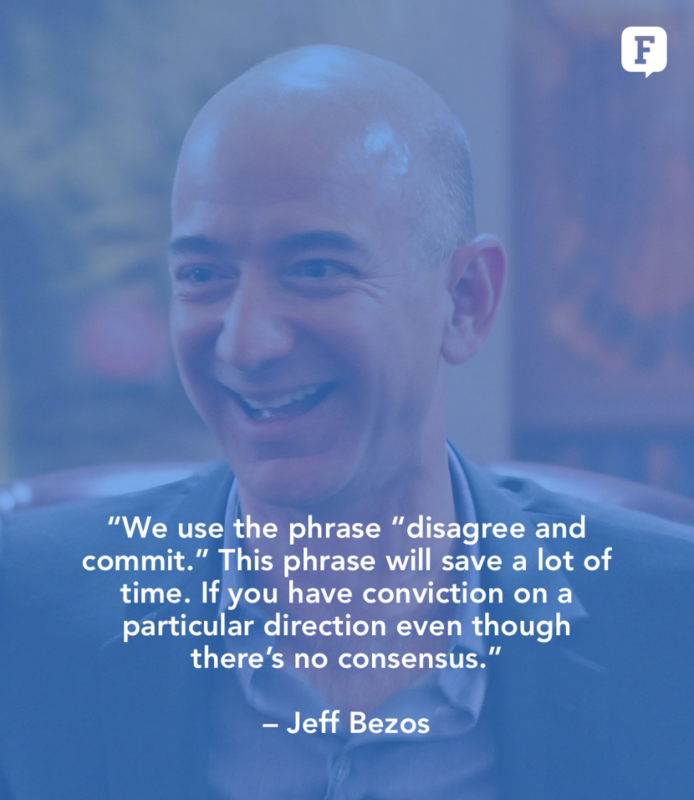 Disagree and commit?” By the time you’re at this point, no one can know the answer for sure, and you’ll probably get a quick yes. This isn’t one way. If you’re the boss, you should do this too. I disagree and commit all the time. We recently greenlit a particular Amazon Studios original. I told the team my view: debatable whether it would be interesting enough, complicated to produce, the business terms aren’t that good, and we have lots of other opportunities. They had a completely different opinion and wanted to go ahead. I wrote back right away with “I disagree and commit and hope it becomes the most watched thing we’ve ever made.” Consider how much slower this decision cycle would have been if the team had actually had to convince me rather than simply get my commitment. Using this phrase actually cuts the time it takes for everyone to decide and curtail what would have been an endless back-and-forth. It’s also a way of showing support to everyone regardless of your own personal views. Communication training doesn’t just underscore the way we converse and communicate with each other. It could also cover important skillsets that can improve your business, like presentation skills, business writing and team management. They can be quite expensive but the benefits can match it when you see your team communicating like clockwork. At the same time, developing your team’s capabilities in communication is also about highlighting their key strengths. Each and every one of us communicates differently. There are people who would prefer emails to face-to-face meetings. Some would be more adept when they are done via auditory means like a phone call. Others via a personal chat message on a team chat platform like Fleep. Check and see which type of communication works well with your team members. Luckily, Fleep allows you to communicate with everyone regardless if they still want to keep using email, video call or messenger format. Communication is really important. Being proactive with communicating out, but also creating an expectation that your team will communicate back, and making it clear how that should happen. 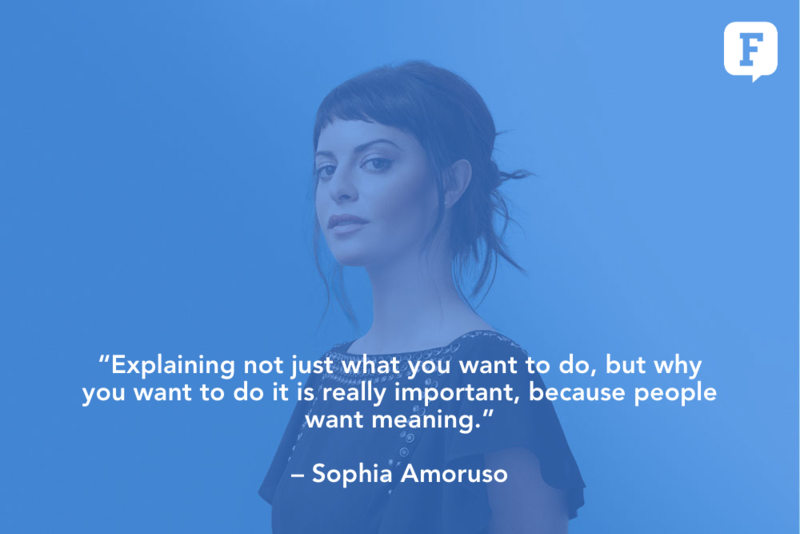 Explaining not just what you want to do, but why you want to do it is really important, because people want meaning. I’ll bet that no one will finish a project or do their work on time if the tasks that are given to them are not clear. Ensure that the entire team understands their scope of work. Round-up the team each week to check on their status reports, ask the right questions and address any concerns they may have. Make them aware of their responsibilities. It’s probably smart to choose a tool that is meant for team communications, and leave phone calls for urgent matters, consumer apps for personal life. So you may consider using a team chat app, like Fleep. Unlike other team chat applications, Fleep is an open network and integrates well with email. It’s a vast open network that allows you to contact anyone, anywhere regardless of what device they have! You can also give out tasks – being clear on everyone’s job and pin important messages that they need to remember. You can even work and organize your contacts into project teams for easier collaboration and discussion. It gives you and your team members the power to make communication easier and less stressful. Once the team is prepped and the chat is up and running, it’s time to set some ground rules. This helps manage expectations for communication, like whether people have to respond quickly or if asynchronous communication works better. Or when and how often the team would need to meet. You may also want to set the tone for your team with some guidelines of participation – allowing ideas to run through brainstorming without passing judgement or ensuring that no one interrupts when another person is speaking etc. All of the rules should be agreed on by everyone. Have everyone agree on their roles and responsibilities. Be clear on the designations and who have decision making power. In this way, everyone knows what is expected of them – and whenever there is a disagreement, it is clear who has the right and responsibility to call the shots. When communication issues rise (as they most certainly will), strive to address them immediately. Have the team leader or other decision-maker serve as the mediator. The first step in addressing such issues is to evaluate if any rule has been broken. Be clear on what your system is for resolving issues, and make sure everyone involved in the issue comes to an amicable resolution. Taking advantage of these tips can help align your team’s goals and improve communication across all levels of your organization. It creates a stress-free environment that is helpful to the success of the project as whole. Communication is always made easy by being open, honest and transparent with one another. Using the right tools, like Fleep, that allow for transparency in the team is great for that too. Treat your team members like family and they are bound to do the same for you. Want to communicate with your team easily? Sign up for Fleep now!